4/30/2012Share this story on Facebook! Evan Heidenrich '08, Sports play-by-play announcer/Host/Producer, 980 WCAP-Radio, speaks about his experiences in the sport media industry. Check out the sport media organizations that attended Sport Media Day! Professionals represented organizations like Momentum Media Sport Publishing, MLB Network, 980 WCAP radio, Achieve Insights, and NeuLion Inc. 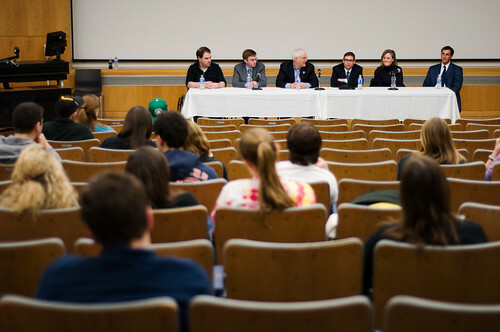 The event was geared towards both underclassmen who are just figuring out their interests to seniors who are passionate and set on pursuing a career in the industry. 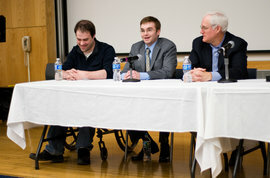 Students listen to IC alumni who work throughout the sport media industry speak at the Sport Media Day panel discussion on April 13, 2012. Senior journalism major Kevin McCall attended the panel to get some feedback on his resume and to see the career paths of people who chose to go into the sport media industry, as McCall hopes to do himself. He says the panel was able to give students a good understanding of the balance between being well-rounded and having a niche. "The whole panel really stressed the importance of not only having a passion for sports, but also for the fields within it such as marketing, promotions, reporting, writing, and advertising," he says. 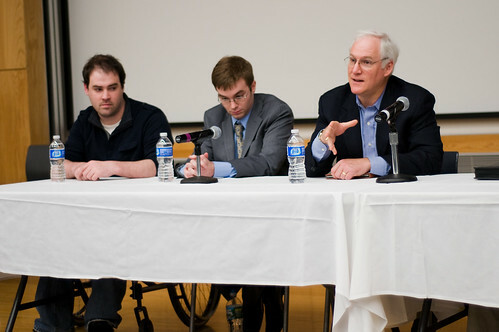 Tab Butler ’81, Director of Media Management and Post Productions, a MLB Network, speaks about his experiences in the sport media industry at the Sport Media Day panel discussion on April 13, 2012. McCall says he thinks the best part of the panel was its diversity, as it included people from all walks of life - ranging from those who started their own companies to graduates who worked in digital media to those who pursued careers in major television networks. "Events like this are extremely helpful for all students looking for an internship or another way to begin a career because they help show the passion and knowledge needed for specific areas within today's large communications landscape," he says.